Adam Trent looks to change people’s perception of magicians with his refreshing approach to magic; entertainment first and tricks second. He doesn’t want people to remember “tricks” as much as the laughs and memories made with the performance. And on April 1st, he accomplished his goal making for a very happy crowd who rose to their feet after his final act in awe. 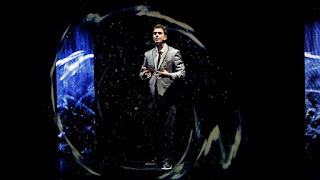 Adam Trent's first act was a mixture of story (telling his history with magic), comedy (PG rated) and typical magic tricks such as his famous iPhone blender act (see Twitch's great response on The Ellen Show), levitating a table, and the grand finale before intermission was an act he had created for Broadway when he was a member of The Illusionists to demonstrate the future of magic. The act was part dance, part projection and part magic. "If you take a 100 people's iPhones and put them in a blender you'll get a 100 different reactions to it so yeah I've had every kind of reaction possible and that's what makes it fun. I've gotten good over the years thinking on my feet and making fun situations on stage even more fun." During the course of the show, Adam dealt with enthusiastic volunteers, bland volunteers, spirited audience reactions and lackluster reactions and he handled each ever so well with comedic flair. Interestingly only one volunteer publicly received a t-shirt as a thank you for coming onstage and that was a young female preteen. Wrapping up his show with his toughest act and most sentimental act, Adam paid tribute to his late Aunt who gave him his first book on magic. 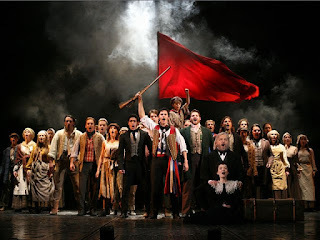 Both acts were certainly gasp-worthy and as he finished the audience leapt to their feet applauding his brilliant talent. If I had to express any disappointment it would be that the show is advertised as "fusing technology illusions, dancing and comedy with classic techniques." Yes, Adam in his interview did mention there was little dancing in the show anymore but even so I expected more technology but we really only had the one technological act at the conclusion of Act One. So we were given a short performance that wet our appetites without it being expanded upon during Act Two. The show is advertised as running 2 1/2 hours but actually I was headed back to my car at 9:10pm (1 hour 40 minutes running time, including intermission). 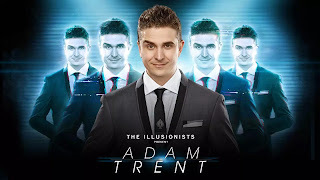 For fans who come to see his show, Adam is selling a few pieces of merchandise for $15 each including a deck of Adam Trent playing (magic) cards with instructions to do I believe 20 magic tricks. If I had carried cash I probably would have bought a set for myself but alas. Thank you as always to American Theatre Guild for the tickets and chance to experience great theatre in our very own community. Next up: Legally Blonde The Musical.